This recipe is from Steven Raichlen’s Barbecue Bible, and we both really enjoyed this new way of preparing salmon! It’s stuffed with a walnut-cilantro-dill filling, and then wrapped in grape leaves and placed on a hot grill. We served the fish with roasted sunchokes drizzled with truffle oil. Fancy! 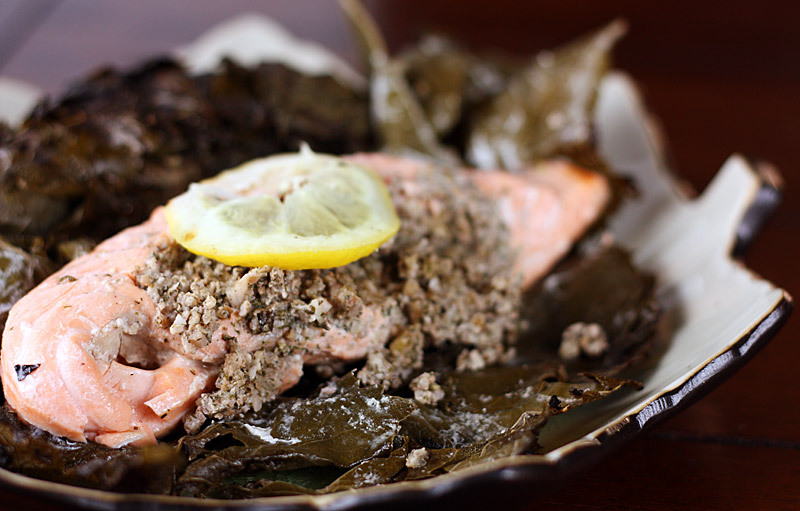 You can totally taste the flavor of the grape leaves on the salmon. So you’re not supposed to eat the grape leaves? The recipe claims not, but I just took a nibble — crispy, smoky, and salty… I’m sure it’s fine if you want it! This is a lot of fish; here, take a lit– hey, hands off my delicious filling! Rinse the grape leaves and soak in cold water for 30 minutes or so. Drain them and pat dry with paper towels. Rinse the salmon under cold running water, then drain and blot dry with paper towels. Place the fillets on a cutting board, and with a knife parallel to the board, cut a deep pocket in each fillet, starting and ending about 1 inch from each end, cutting almost all the way through. Season the fillets with salt and pepper, inside and out. Combine the walnuts, garlic, dill, cilantro, and lemon juice in a food processor and mix to a coarse paste. Taste for seasoning and adjust as necessary. Spoon the stuffing into the fillets, dividing evenly. Arrange 2-3 grape leaves on a work surface to form a rectangle 2 inches larger than the piece of salmon. Place a piece of salmon on the top of the grape leaves, place a lemon slice on top, then cover the salmon with the remaining grape leaves. Fold and tuck the ends under the salmon. Secure with — well, we used floss. Repeat for the other fillet. Set up the grill and preheat to high heat. Brush and oil the grill grate. Place the wrapped fish over direct heat and grill until the grape leaves are browned and the fish is cooked through, about 4-6 minutes per side, depending on the thickness of the fish. Using a spatula, transfer the fish to a serving plate. Unwrap the salmon and discard the grape leaves before eating.